Inside Scoop: These Golden Oven Roasted Smashed Potatoes With Crispy Baked Shallots are going to turn your healthy dinner into something truly special. This recipe for Golden Oven Roasted Smashed Potatoes With Crispy Baked Shallots (haha yes this is a longwinded title) was actually the FIRST ever recipe that we entered into a contest! 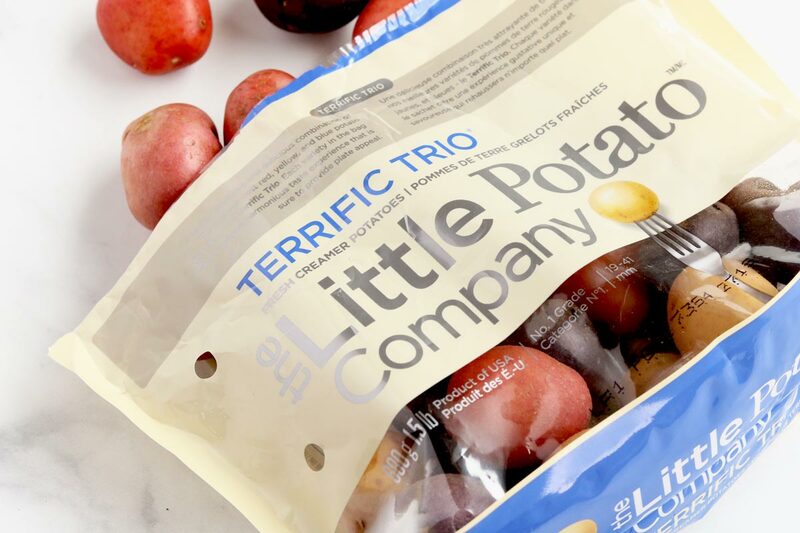 The contest was a collab between one of our favourite companies, The Little Potato Company and MasterChef Canada, and although we didn’t end up winning, we are truly proud of this one. First of all, if you are yet to try oven roasted smashed potatoes, well, you definitely should get on it, because not only are they INCREDIBLY easy to prepare, they are fun to smash, and turn out really quite yummy. 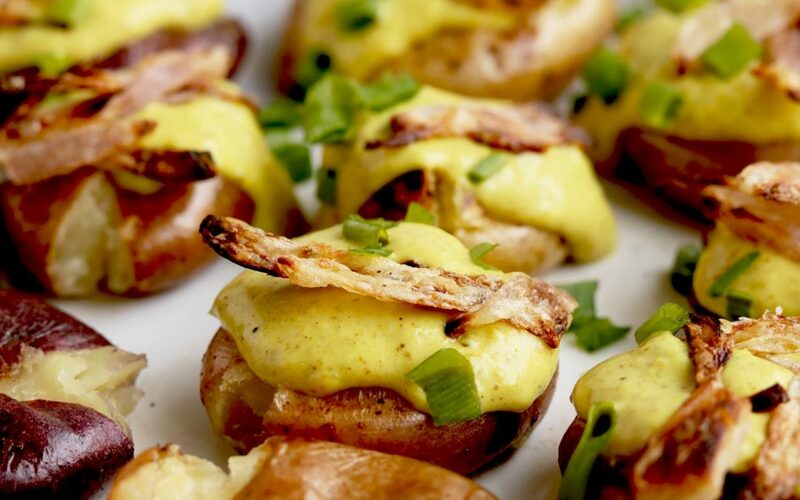 Literally a mash up of a roasted potato and mashed potatoes, and we just love them! 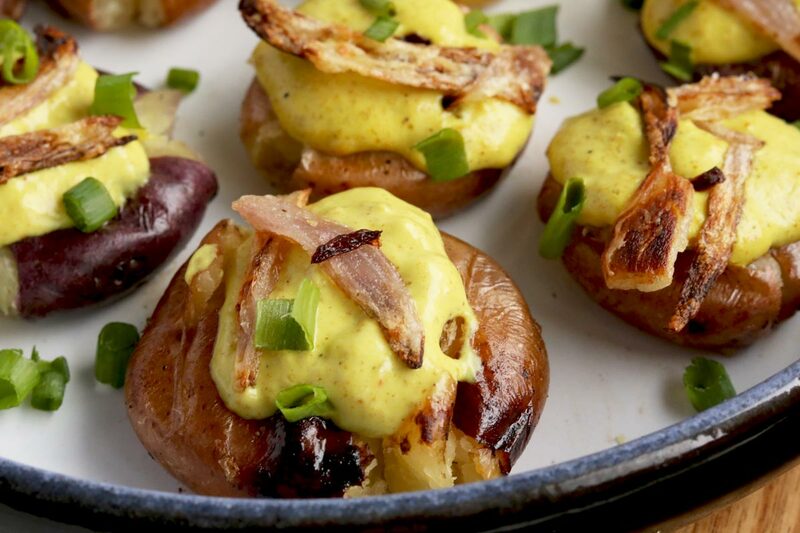 For this inspired recipe, instead of leaving them simply seasoned, we decided that our rendition of smashed potatoes needed to be elevated by a cheesy golden curry sauce and topped with crispy baked shallots. 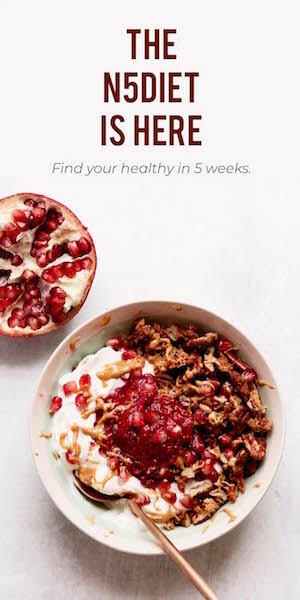 In an easy, yummy, healthy, and filling kind of way. 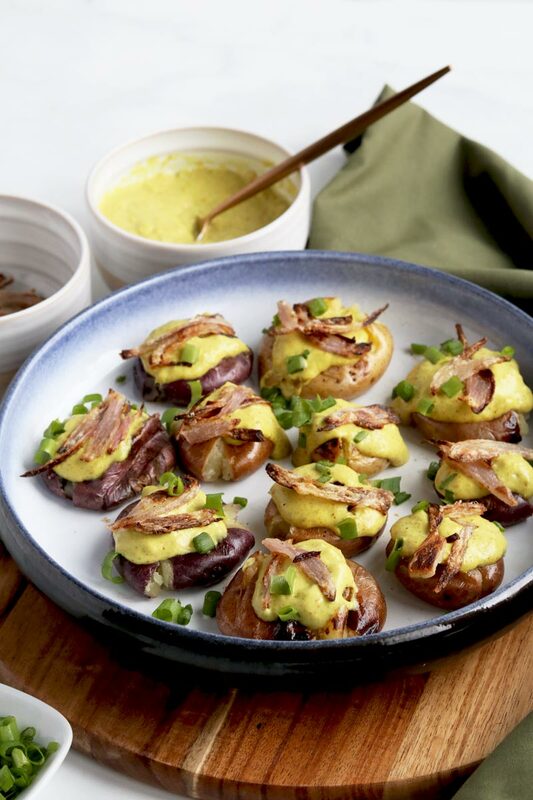 But this amazing recipe also tastes incredible, and it’s the curry sauce plus a simple sweetness and texture from the crispy baked shallots that really step these smashed potatoes up a notch. You’d think that this sauce would be hard to create, but it’s actually so simple. It can be made in 15 minutes and makes whatever you are eating taste so much better. Fish – a great combo. Other vegetables, the perfect sauce. A steak topper… just wonderful. 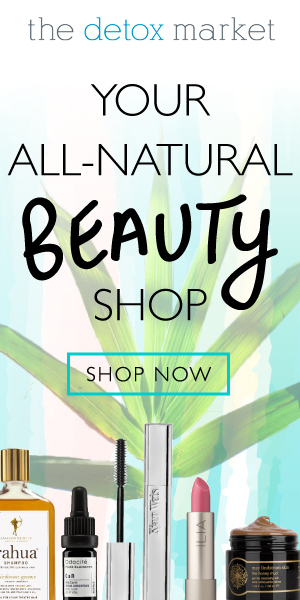 Tempeh or tofu? Mixed with a big bowl of veggies, is just divine! 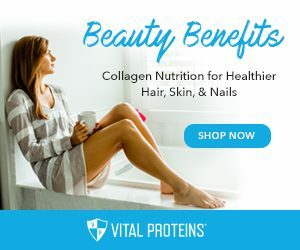 Plus, if you are doing dinner with a protein and other baked veggies, this sauce makes just enough to load on the entire dinner and it takes what is seemingly a boring healthy dinner (veggies, plain protein and starch) to the next level. 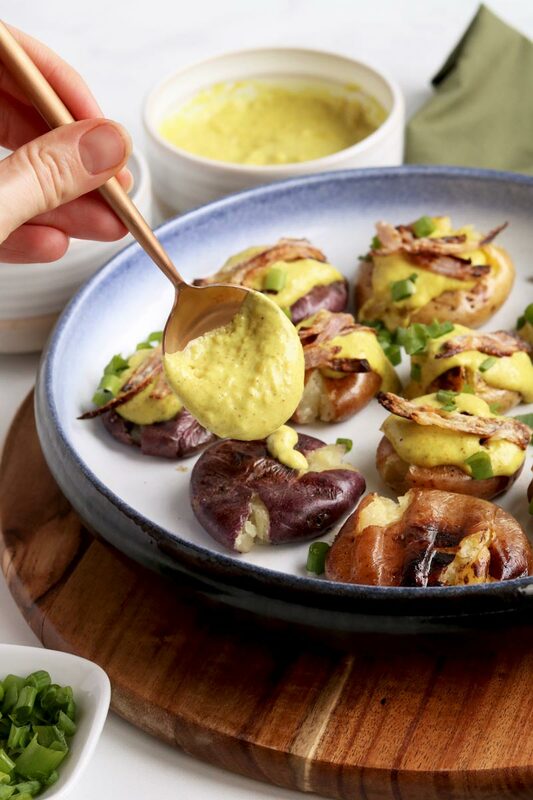 One of our favourite things about these oven roasted smashed potatoes with the golden curry sauce is that there is just enough healthy fats to help fill you up and keep you feeling full. 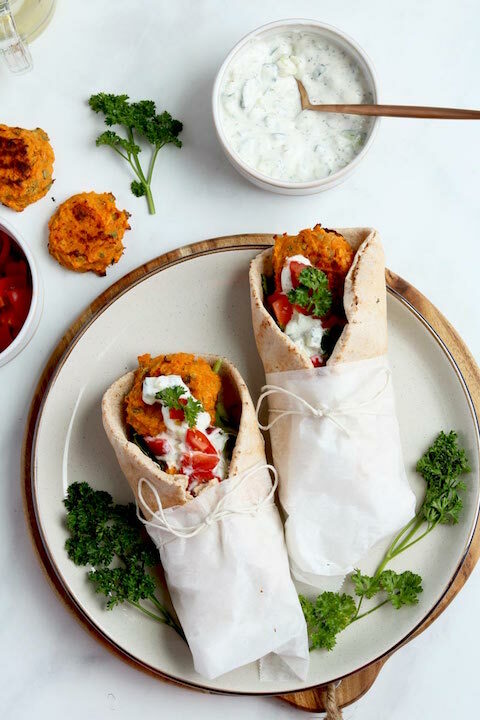 This recipe is healthy, loaded with antioxidants, anti-inflammatory spices, have a great depth of flavour, and the curry sauce can be used on almost anything. 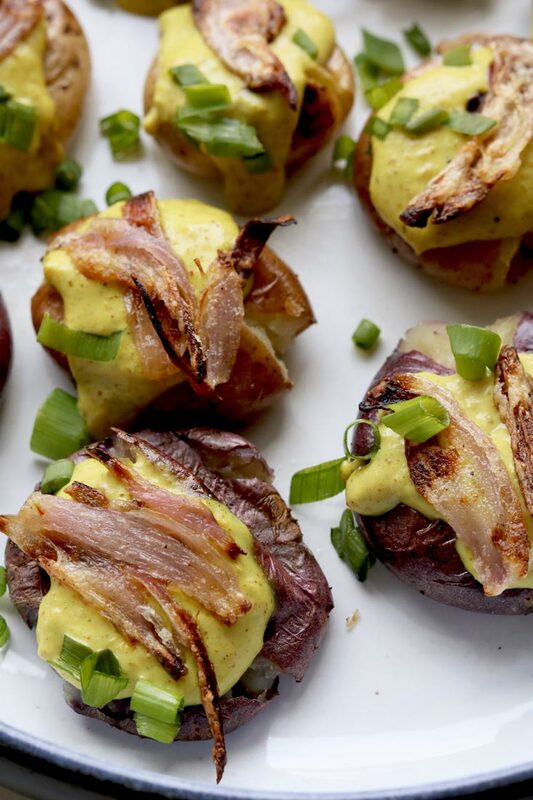 We’re not going to lie, one of our favourite elements of this recipe for Golden Oven Baked Smashed Potatoes isn’t the curry sauce, but instead the baked crispy shallots. Don’t get us wrong, the curry sauce is bomb!!!!! However, the shallots just really pull together the whole recipe. We’ve been making crispy shallots this way for awhile, and this technique is definitely one of our new favourite ways to make our veggies crispy. We use this method on our carrots, sweet potatoes, and other dry veggies like broccoli or cauliflower. But, when it comes to shallots or onions, it’s really the best technique because it makes them taste as if they just came out of a fryer. And, all you need is corn starch, or if you are Paleo or grain-free, go for arrowroot powder, toss in oil and starch and lay flat to bake. 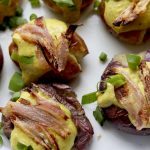 These Golden Oven Roasted Smashed Potatoes With Crispy Baked Shallots are also a pretty awesome gut healing recipe. 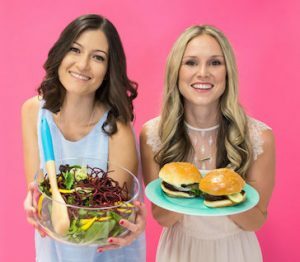 Something we are all about over here, and so much so that we created a list of our top 25 favourite gut friendly foods for you. 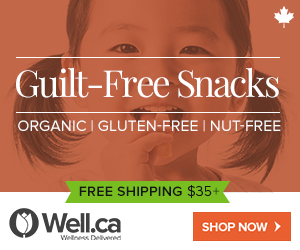 To download your list of our top 25 favourite gut healing foods, click here. What do you think about these golden potatoes? Do you think they will make their way to your dinner table? These Golden Oven Roasted Smashed Potatoes With Crispy Baked Shallots are going to turn your healthy dinner into something truly special. Preheat your oven to 415F. Toss the potatoes in oil, salt, pepper and lemon. Lay on a parchment lined baking sheet. Next, take the shallots and cut the bottom and top off, remove the skin. Slice lengthwise in half, then lay flat and cut the shallots lengthwise until you have thin slices. In the same bowl that you tossed the potatoes, add the shallots, arrowroot powder, salt and oil and toss to coat. Add the shallots to a separate parchment lined baking tray. Place both the shallots and potatoes in the oven. Cook the shallots for 15-18 minutes, flipping half way (they will be golden and crispy, remove before they become dark brown/ burnt *keep an eye). Cook the potatoes for about 40 minutes total, until they are very soft. While the potatoes and shallots are cooking, heat a saucepan over medium. Add the shallots, garlic and ginger to a mini food processor and process until you have a paste. You may need to add 1 Tbsp of water here to ensure it gets processed properly. Heat ½ Tbsp of olive oil on your skillet, add shallot mixture and cook for 1-2 minutes, until fragrant. Next add all your spices (curry, tandoori, turmeric, coriander, salt and pepper – it’s easier if you pre-make this mixture) to the shallot mix and stir for about 30 seconds. Add the canned coconut milk and stir until the spices have dissolved into the coconut milk. Add the nutritional yeast and stir. Then add the arrowroot/ water mixture (if you’d like this sauce thicker) and stir. Cook for about 7-10 minutes. Last add the lemon and season with salt and pepper to taste. Once potatoes are cooked remove from oven and take spatula or fork and smash the potatoes. Drizzle with the curry sauce, and sprinkle with shallots. Garnish with green onions.